People always ask me if I ever get tired of shooting at some of the same wedding venues. Do I feel that wedding couples are all the same? I always say no and I mean that. I once shot at Avalon Manor three Saturdays in a row and it had a different flavor and different look each time. I like to see what my clients and their families are going to put on display or what event they may stage. Not too mention the different types of people and cultures that I photograph. In the above collage you will find a Star Wars garter, pink All Star Converse shoes for the bride and engraved I Do and Me Too shoes. Vintage jewelry and specially made hangers are becoming venerable classics these days as well. A recent trend and one that I've really enjoyed photographing are father and daughter first looks on the wedding day. Father and daughter wedding day first look photo collage. When you think of wedding detail shots, no doubt rings come to mind. I always try to do something unique and interesting with them and very often I will use the bride and groom's decor in the photo. I'm not sure why, but Fall weddings tend to bring out the most decor. Perhaps people are just really attracted to the Autumn colors. Fall wedding decorations photo collage. The classic shot of the hanging dress needs to included here as well. One of my more recent weddings had a super sweet sign and sentiment hanging over the bed. I made sure to include that in one of our dress photos for sure. Always Kiss Me Goodnight wedding decoration. I wrote above about uniqueness in every couple. In the collage below we have henna decorated hands, harpist Jamie Lynn Haney performing, a couple entering their reception via the military honor guard, a bride reading a message from her soon to be husband, fabulous uplighting and the back of an equally fabulous wedding dress. The reception is usually where I take most of my wedding detail photos. This is where I tend to forget that I was just at this very banquet hall the previous week. It's certainly fun to see what I will find waiting for me to photograph. 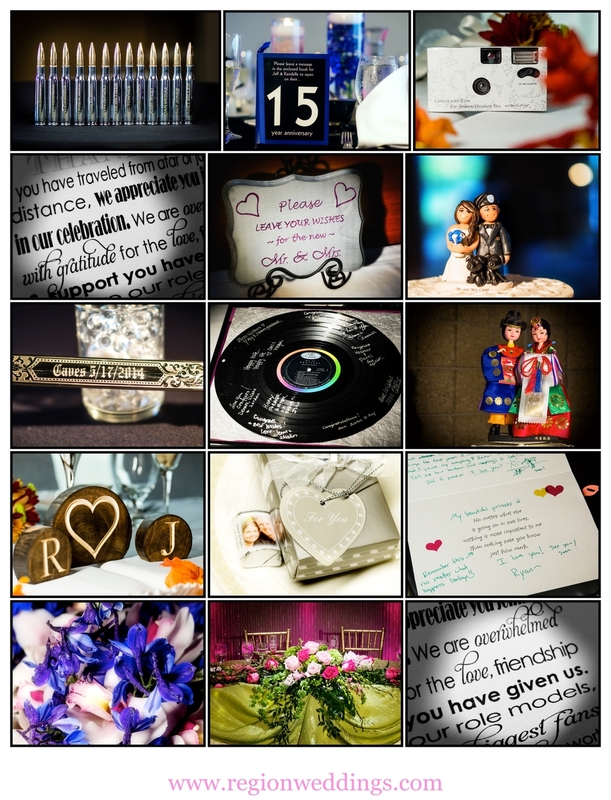 In the photo collage below, you will find everything from artilery ammunition (gifts to the groomsmen) to a traditional film camera for guests to snap pictures on. You didn't think I would forget about cake did you? Signature drinks for the couple is another growing trend and cupcakes are alive and well too. Wedding cakes and treats photo collage. I hope you have enjoyed all of these wedding detail photographs. I have so many and I simply grabbed a few from the past two years. Perhaps in the off season I will look for more and share them here. In the meantime, have fun dreaming up all the fun stuff you will be showcasing at your wedding! !